WHAT IS A POP UP SHOP ? Sighted as early as the 1990s in large urban cities such as Tokyo, London, Los Angeles and New York City, pop-up shops and pop-up retail are temporary retail spaces that sell merchandise of any kind. That’s right, just about every consumer product has been sold via a pop-up shop at one point in time. From art to fashion to tech gadgets and food, pop-ups are exciting because they create short-term stores that are just about as creative as they are engaging. And they come in all shapes and sizes. 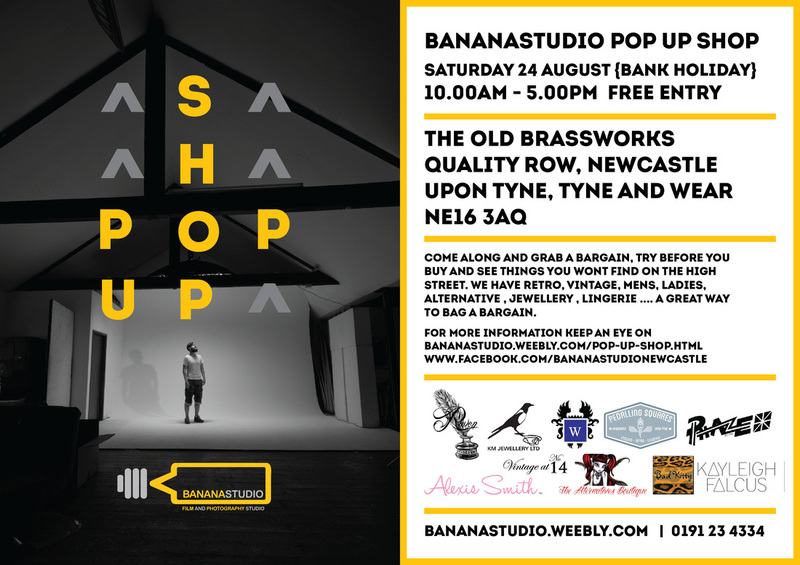 We are delighted to bring the first Pop up Shop to Bananastudio, the perfect venue and location. We have ample free parking all round the building. Come along and grab a bargain, try before you buy andsee things you wont find on the High St.
We have Retro, Vintage, Mens , Ladies, Altenative , Jewellery , Lingerie ....A great way to bag a bargain. along with Bohomodels providing a fashion show for the event , music and refreshments.